Conglomerates or entrepreneurial enterprises—buying is a team sport. 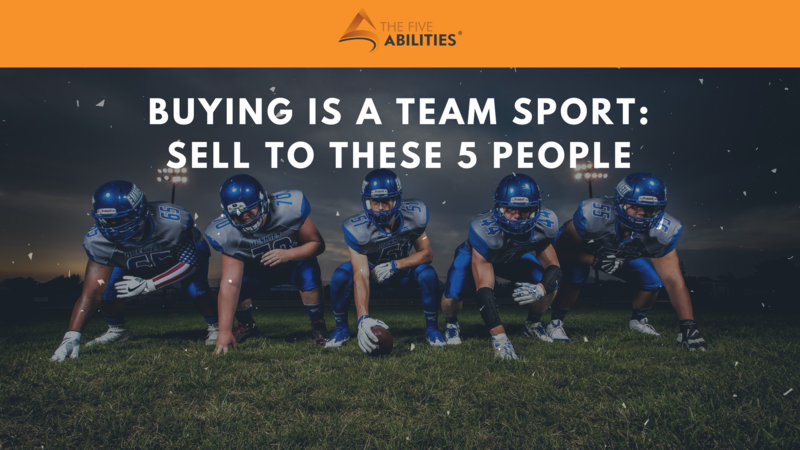 Don’t get caught selling to only one team member—even if she’s the quarterback. Building internal consensus is a must for salespeople. In an article by Seismic, 6 Top Challenges Salespeople Face Today, they state, “Relying on an individual buyer makes building an internal consensus difficult.” I’d say impossible. You’ve likely heard the phrase ‘stuck in procurement.’ Often salespeople get stuck selling only to people who will talk to them and that’s often the gatekeeper. Gatekeepers are often, but not always, in the procurement organization and they’re not YES people. This is where the term “stuck in procurement” originated. The YES person – The one who can say yes and make it stick. The one who everyone else looks to for direction and approval. The founder, the boss, the expert, the investor, the board member, etc. These people earn their position not through promotions but by being recognized as the best at something. Ask around and you’ll quickly learn the names. In Microsoft everyone knew Gates and Ballmer. Others who could stick “yes” were Jeff Raikes, Kevin Johnson, Jim Allchin, and Bob Muglia. They’re in every company. People who make things work – The YES person won’t buy anything without knowing it’ll work. They come with differing titles—program manager, project manager, IT specialists, distinguished engineer, etc. They must validate that your offering will work for them. It’s your job to help them validate your offering. People who advise YES people – YES people always have their inner-circle who advise them on decisions. These are people who have gained the trust of the YES person. Ask around to see who the YES person spends the most time with. Those are the people who advise the YES person and the rest of the team will know the names. Find them—sell them. People with the money – Finance and procurement are almost never the YES people but they’re relied upon heavily to ensure good pricing and to ensure there’s budget to spend. These are often gatekeepers, but they’re an important part of the team and while they can’t stick YES, they can stick NO. Internal Customers – This is the most over-looked tactic in selling. Every YES person has internal customers who must be happy with purchase decisions. For example, IT executives must get thumbs-up from manufacturing executives who use technology to build things. Spending money on something internal customers don’t like, or use, is a quick way to lose your status as a YES person. When selling to Boeing, I hadn’t earned the VISABILITY or CREDABILITY to even be considered an underdog. We were invisible. HP had great products, but the incumbent sales team had the ear of the YES person—the head of IT. Boeing, like many companies in the late 80’s was an IBM house—their proprietary products ruled. The IT leaders didn’t want the hassle of managing multiple computing environments so beyond small, non-strategic projects, HP and others, hadn’t earned the VIABILITY necessary to be a strategic option. 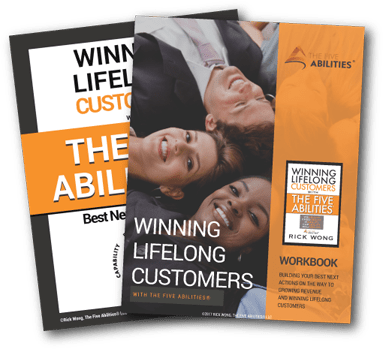 We weren’t visible, credible, or viable and we certainly didn’t know the decision-makers well enough to be capable of delivering on their personal motivations for buying (CAPABILITY). We hadn’t done enough to show our RELIABILITY. We lacked The Five Abilities® on all counts. The YES person wouldn’t meet with us so, with nothing to lose, I called on his internal customers. I found open doors with plant managers, facilities managers, VPs in sales and marketing, and many others. All the business leaders wanted to know more about the IT modernization that had been rumored. My competition wasn’t selling to them, after all they had the ear of the YES person. The day came when the YES person decided it was time to modernize using the UNIX operating system. UNIX was key to the Open Systems movement that held the promise of companies no longer being tied to a single computer supplier. IBM had launched a UNIX variant called AIX, so it was time for the YES person to move. We were invited to compete, in partnership with Andersen Consulting—we bid HP’s version of UNIX called HP-UX. When IT leaders started informing business leaders about UNIX, it wasn’t news. They had already heard it from us. We spent almost a year educating most of the business leaders about the trends in computing and the Open Systems movement. We earned their trust. In the end, we won that project, I exceeded my annual quota in two months, and two years later we were chosen as the preferred UNIX supplier to Boeing. It all started with us calling on the YES person’s internal customers. Moral: Sell to the team and you’ll find more than one path to the win. Enter your name and email to get your FREE workbooks and occasional updates from my blog. © Copyright 2019 All Rights reserved. The Five Abilities.